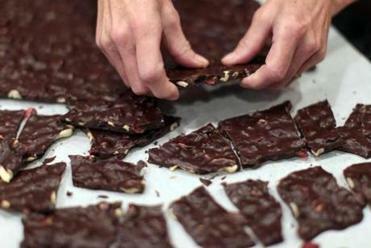 Beth Kirsch makes artisan chocolates and offers classes at her Newton home. 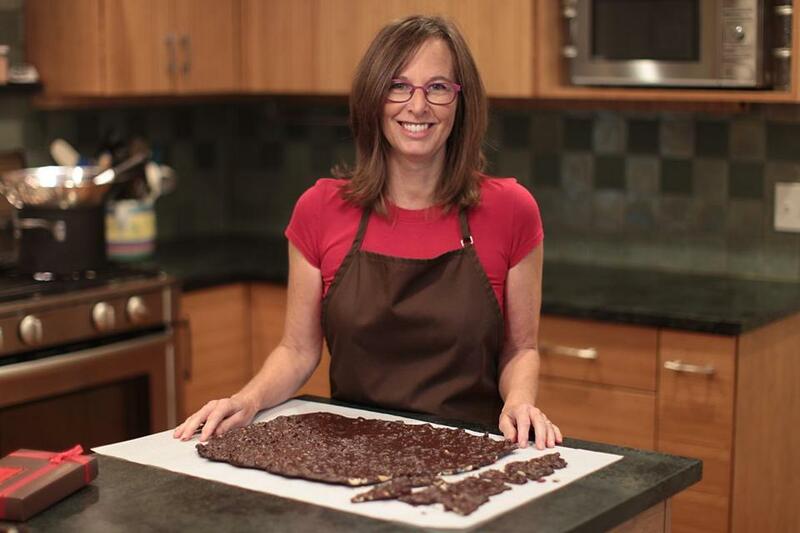 NEWTON — For Beth Kirsch, a three-time Emmy-winning children’s media producer, the road to becoming a chocolatier began with an Eiffel Tower-shaped mold she bought in Paris four years ago. At home, she tried making chocolate in the mold but couldn’t get it out. About three years ago she took a chocolate-making class, which led to an internship, which led to an online course. And that led to Beth’s Chocolate, the business she now runs out of her home kitchen. Everyone in her family — husband Steve Mascho; son Ross, 29; and daughter Kira, 25 — loves chocolate, says Kirsch, 58. “Everywhere we go we organize everything around finding chocolate and trying it,” she says. She still produces children’s media, but she is scaling back. “I always felt that after I was done with my career I wanted to do something physical,” says the nearly-empty nester (Kira, a fourth-year medical school student, lives at home). 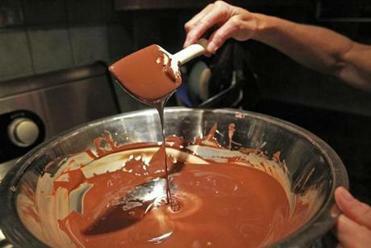 Standing for hours at a time stirring, chopping, dipping, and packaging are just some of the activities that differentiate chocolate making from her other work. She experimented at home, then approached Elaine Hsieh and Catharine Sweeney, of EHChocolatier, requesting an internship. After passing an “audition,” during which the owners observed the way she worked in the kitchen, Kirsch entered a three-month unpaid internship with the Somerville company. “I learned so much there and they were so generous,” she says. With the combination of bright, tart dried cranberries and chopped cashews, this bark is a delicious treat and a wonderful holiday gift. Then the would-be chocolatier renovated her kitchen. Little touches, like a hands-free faucet for easy washing of cocoa-coated hands, separate storage areas for ingredients, and a long, two-level island that accommodates her production (she sells chocolates to local shops) and classes (she teaches 6 to 12 people at a time). Students go home with an assortment of bonbons they have made. Truffles and barks are good starter chocolates and easy to do in groups; molded chocolates require more precision, so these classes are limited to nine. Kirsch works almost exclusively with Valrhona chocolate, whose taste and texture she prefers. All her creations are free of added sugar and preservatives. The focus, she says, is on “very pure flavors.” She loves to experiment, often mixing ingredients like mint, lime zest, and rum for a mojito bonbon; but her confections never taste overwrought. A customer favorite is the cappuccino bonbon, with layers of coffee and cinnamon ganache. For the milk chocolate coffee ganache layer, she roasts espresso beans, steeps them in cream, and adds espresso powder. A cinnamon layer contains white chocolate. She hand-dips the ganache in 70 percent chocolate, sprinkles the squares with pure Hawaiian cane sugar and cinnamon, and tops each one with a coffee bean. Probably her most popular item is the Peruvian gold bonbon, featuring a dense, rich ganache made from a rare single-origin Peruvian chocolate, which she chose for its depth of flavor and creamy consistency. Ultra-thin crunch, topped with cocoa nibs, was inspired by a similar confection made by chef Christian Constant, which Kirsch tasted in Paris. Hand-cut into squares, she says, “They look the simplest but they’re very tricky to make.” These can be addictive, as are her barks, with fruit, nuts, and seeds. On a recent Sunday afternoon, six women spend three hours making truffles, mendiants (chocolate disks), and cashew-cranberry bark. There is an assortment of decorations, including red peppercorns, Himalayan sea salt, nuts, dried fruit, and seeds. She also uses thermal transfer sheets, which are on food-grade mylar or acetate, with designs made with colored cocoa butter that can be pressed, or transferred, onto the chocolates. As students move from activity to activity, it becomes clear that Laura Nooney, a Brookline resident, is not entirely new to this game. In fact, she says, she and a friend once took a class at ChocoLee. “It was a blast.” A year ago, Nooney was at a party where Kirsch brought an assortment of chocolates and decided to “kick it up. There’s so much pleasure behind making it and not just eating it,” says Nooney. But nobody in the room is knocking consumption. “I eat chocolate three times a day,” Kirsch says. If not more. BETH’S CHOCOLATE ($3-$25) available at Volante Farms, 292 Forest St., Needham, 781-444-2351; Upper Falls Liquors, 150 Needham St., Newton, 617-969-9200; Post Road Liquors, 44 Boston Post Road, Wayland, 508-358-4300; Vinodivino, 899 Walnut St., Newton, 617-527-8466; or go to bethschocolate.com.